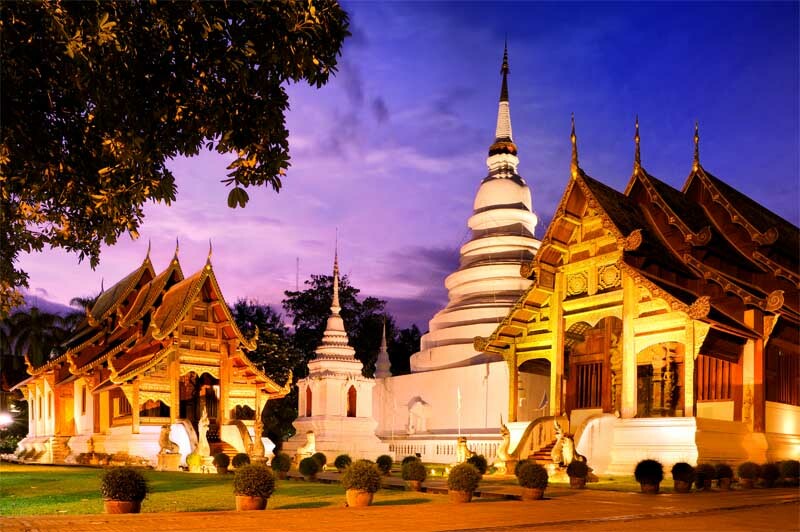 Chiang Mai is an enchanting wonderland! Emerald hills enfold her in a sweet embrace. Sapphire skies grace her peaceful face. Warm sun beams a golden smile. Waterfalls whisper, sing, and sigh. Breezes bear a perfume sweet. The Ping River laughs and sparkles at her feet. Chiang Mai is rich in romance. For couples planning marriage, she provides a dreamy wedding destination. Chiang Mai teems with temples, conferring kindest blessings. Within her welcoming arms are charming restaurants, delightful cooking schools, and beautiful wildlife. Location – Off Huay Kaew Road, Chiang Mai, at the base of Doi Suthep, about 100 meters up the hill from the zoo entrance, on the left. 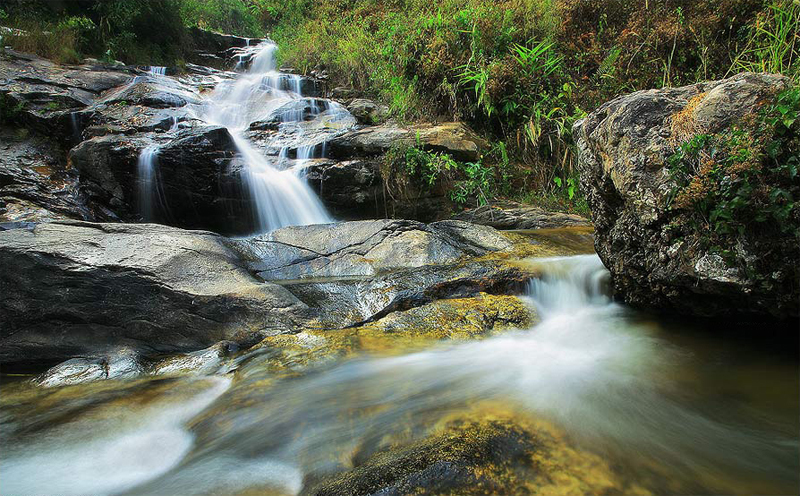 For a refreshing romantic experience, visit the Huay Kaew Waterfall. This pristine cascade, resembling a bridal veil, consists of two tiers. Large rocks create the perfect picnic spot. If you hike up the hill a short distance from the falls, you’ll find pools of water where you can have a cooling swim. Entrance to the waterfalls is free. 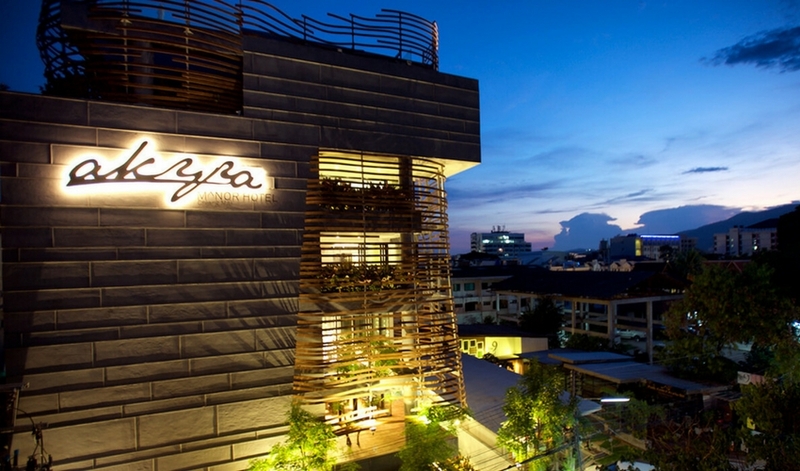 Named after the waterfall it faces, this restaurant is a jewel, shining from the cliffs of the Chiang Mai countryside. The entrance to this oasis is grand! A wide wooden staircase, flanked with red pillars and lush plants, leads to this tropical alcove. A flowered mural glows in red, blue, and gold. There are several seating options, each with heart-stirring views. You can relax on an elaborate terrace, sit alongside the waterfall, or cozy up at a hilltop table. Rich wood creates a warm atmosphere, along with elegant table settings. Flowers lend a cheerful touch. The cascade’s gentle rush creates a musical backdrop for your meal. During the day, the sun casts luminous rays, dancing on trees and plants. At night, soft lights set a soothing tone. The cuisine at this haven pops with vibrant taste and colour! Thai spices delight and dance on the tongue. Sauces bathe the mouth in hearty flavour. Fresh vegetables and fruits complement the savoury entrées. Service is friendly. Prices are reasonable. Romance reigns at Huen Huay Kaew. 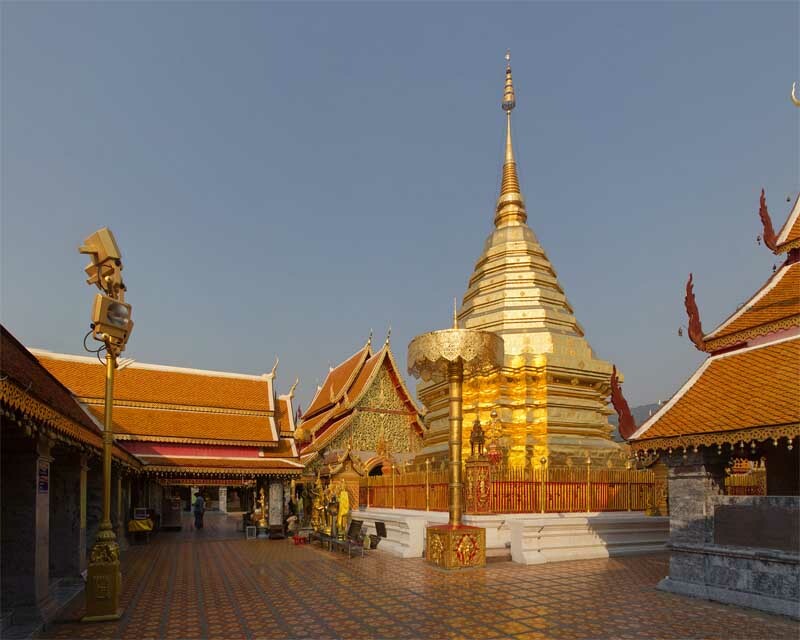 Cresting the mountain of Doi Suthep is the revered temple, Wat Phra That. A resplendent red brick staircase of 309 steps leads to the temple entrance. You can also reach the top by cable car. A lower terrace is bordered with large bells that visitors can ring to bring good luck. According to legend, a white elephant chose the site of this temple. On the northwest corner, an elaborately carved statue, painted in red and gold, pays tribute to the animal. Crowning the temple summit is an upper terrace with a gold dome and parasols that sparkle in the sun. A series of ornate pagodas surround the dome, containing multiple shrines, bells, and statues. A colourful mural depicts the life of Buddha. A large viewpoint provides spectacular views of Chiang Mai. Be sure to visit the adjacent museum, explaining the origins of the temple. Visitors are requested to wear clothing covering the arms and legs. Before entering the temple, you’ll need to remove your shoes. Then you can kneel before the presiding monk. He will pronounce a blessing upon you, and sprinkle you with holy water. A second monk confirms the blessing by tying a white string bracelet at your wrist. He will also offer a prayer for good health, a peaceful mind, and happy life. It is customary to leave an offering in gratitude. Typical gifts are fresh fruit, sweets, and money. Couples will enjoy caring for and riding an elephant on a romantic jungle tour. Patara Elephant Farm offers half-day and full-day tours in small groups. Each visitor is assigned their own elephant and trainer. The full-day Elephant tour begins with pick-up at our resort at 7:30am. You’ll be matched with an elephant that complements your personality. The trainer, or “mahout,” will teach you how to care for your elephant, including bathing, feeding, and checking the animal’s health. You’ll learn how to communicate with your elephant, using different commands. Then you’ll receive instruction on how to mount and ride. First you’ll take a short trip to a local temple. Then you’ll travel a jungle trail to a camp where you’ll enjoy a gourmet picnic lunch. After the elephants have eaten, your jungle trek will continue to a local waterfall. Here you’ll get to bathe your elephant and splash around together. Then you’ll journey back to camp at around 4pm, for return transportation to our resort. The entire tour encompasses 10-12 hours. What to Bring – Although you ride barefoot all day, you should bring waterproof shoes for the waterfall, to safely negotiate the rocks. Wear long shorts or slacks, as elephant hair is rather rough. Also bring insect repellent and sunscreen. You and your honey can have fun taking a cooking class at this reputable school. Classes are held in a private home on a quiet street near Tha Phae Gate. Group size is limited to 10 people. Transportation to and from the school is available upon request. The kitchen atmosphere is clean and cozy. Instructors are warm, polite, patient, highly-skilled, and fluent in English. Each class begins with a trip to a local market for a fun lesson on Thai ingredients. Back at the school, a demonstration precedes the preparation of each dish. Then you’ll have your own gas stove and the personalised instruction of your teacher to prepare your gourmet meal. Every class includes five dishes, based on your selection of soup, appetiser, curry paste, entrée, and dessert. You’ll also learn proper knife technique and how to make jasmine and sticky rice. Dishes can be modified to accommodate vegetarian and vegan guests. You’ll receive a recipe book of all 25 dishes taught at the school, including tips from 30 years of family cooking. This Boutique Hotel in Chiang Mai that offers an intimate and exclusive all-suite luxury hotel experience. Deluxe Suites are appointed with balcony bathtubs, luxurious linens, plush bathrobes, and pampering toiletries. Soft lighting and muted colours further ramp up the romance. Begin your day gazing into each other’s eyes over coffee, tea, or espresso, freshly made with your own in-room appliances. Enjoy some cozy background sound with a state-of-the-art entertainment system. Come evening, snuggle up and watch romantic movies on a flat-screen TV with DVD capability. Enhance the romance with snacks and drinks from your fully-stocked mini-bar. Deluxe Suites are exquisitely designed with couples in mind. Manor Suites are for guests with families or couples seeking capacious space. They have all the amenities of our Deluxe Suites, along with room to roam. Expansive additions are a walk-in closet and elegant bathroom. Manor suites are fit for royalty. Akyra Manor is made for romance. Chiang Mai is made for enchantment. Combined, they create the perfect romantic escape. Welcome to the magic of Chiang Mai!